Hoses from TESS controls the stage floor and the orchestra pit at the Opera. They ought to work, which makes inspections and controls vital. All of the hoses connected to the stage floor was controlled last summer. To make sure the elevators, machines and technical systems in one of Norways largest signaling buildings functions at their best you need durable hoses and controlled maintenance of hydraulics and lubrication. This dictates a close working relation between the operational engineer at the Opera, Egil Bekkeli and Service manager at TESS, Frode Eriksen. - The cooperation functions so well we nickname TESS our court purveyor, says the operational engineer. The Opera house in Oslo was inaugurated in 2008 and has become a monumental landmark visited by approximately 1,4 million people every year. 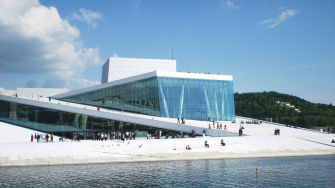 The building is designed by the architectural firm Snøhetta and consists of three audience halls, the largest holding 1388 people. The elevator behind the main stage covers 15 floors, with 4 basement floors primarily housing machine rooms and technical rooms. In total TESS has delivered 606 hoses to the Opera house, all of them included in the service- and maintenance program TESS Hose Management (THM). Last summer 208 hoses were delivered and assembled, including 16 hydraulic hoses of nine meters and 1 ½ inch dimension, placed in belts. More deliveries are planned in the near future. In total, the entire plant consists of about 1500 hoses..
TESS’ hydraulic hoses controls the floor on the main stage and the orchestral pit. The main stage has a surface of 16 x 16 meters and consists of 16 separate elevators. The elevators are run 2 meters up or down, tilted or rotated to create scenes on stage. Scenery up to 9 meters high are ready underneath the main stage and are lifted during shows. The orchestral pit is adjustable in height and size depending on the number of orchestral members and the scenography. Operational engineer Egil Bekkeli is responsible for the technical operation at the Opera house. He is satisfied with the quality of the hoses and the service from TESS. – By the first week of August all the hoses from TESS was assembled and operational. They’ve been thoroughly tested this fall and winter, and we’re very satisfied thus far, says Bekkeli. Service manager Frode Eriksen at TESS is responsible for the agreement with the Opera house, and according to Bekkeli the main reason for TESS getting the contract. – There can be no doubt that Frode Eriksen’s efforts are a big reason for our choosing of TESS as the court purveyor of hydraulic hoses. When he took over the responsibility thins became clear, and there was a consensus to keep working with TESS. Eriksen on the other hand says the credit for the good service and customer experience is shared with several others. – Measuring the correct length for the 16 belted hoses were a big challenge. We had to line up the hoses to measure them. A close cooperation with the hose team at TESS, and especially Hanne Gro Halvorsen, made this a very good experience for the customer, says Eriksen.